A few weeks ago, I showed you our gorgeous apartment. I neglected to include our bedroom in any of those photos, though. Why? Mostly because we had a decorating budget when we moved in, and it went towards things like our first dining room table (yay! ), a new couch (our old one wouldn’t fit up the stairs) and a bookshelf. Because really, hundreds of books stacked against a wall might look creative, but when you have a dog who runs the cat around for fun, they wouldn’t be stacked for long. 1) It’s about 10×10, with a teeny closet and only one window. 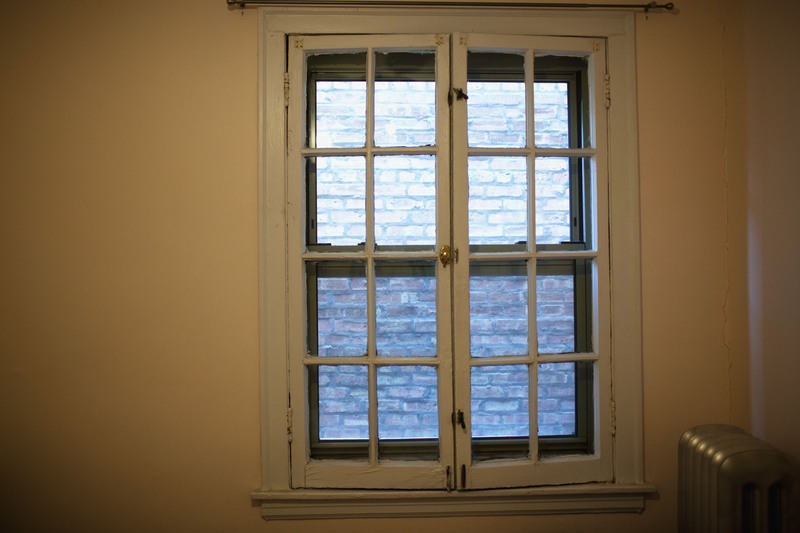 2) Said window looks out onto a brick wall. 3) The paint color we chose to cover the dark brown (!) that was there when we moved in looked like a blush peach under the incandescent tester box at Lowe’s, but in our really, really, REALLY dimly lit room, it looks very pink. That photo was taken just before noon, when the sun is best in here, with all the lightbulbs on, adjusted white balance, an almost wide-open aperture, and a low shutter speed. It looked gorgeous in the wide-open store, but it’s not so gorgeous when you stub your toe on that corner every single morning because you’re severely near-sighted and can’t clear the itty bitty corner where there’s maybe a foot of space between the radiator and the edge of the bed. Not that I know this from experience, or anything. So what are we going to do about this? Well, first and foremost: daylight bulbs. I know it’s not the same as sunlight, and I actually used to hate them. But I really hate how yellow incandescents are in there. I think the yellow tint is fine when you have real daylight to balance it out, but it just doesn’t work in an almost completely dark room. And then, we’re putting a little money in it. If we’re going to live here for at least two more years, I think it’s worth it! Side note: how freaking cute is that dog? Sunday would look just as cute in that room. I'm shoe-happy with a penchant for photography, good books, red wine, and time with my lovely fiance & friends. I talk about all of that and much more on this blog. Follow along! 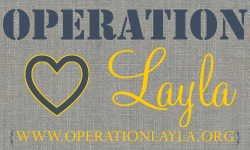 Operation Layla is the lovechild of a wonderful group of girls banding together to help an awesome friend in need of surgery - please, donate anything you can! Details and a website to come soon.